Heat oil in a skillet over medium-high. Add the diced bell pepper and season with a little salt. Saute until crisp-tender, 2 minutes. Transfer to a bowl. Back in the skillet, add the spinach; cook until wilted, 2 minutes. Transfer to a small strainer and press out any excess liquid. Roll out the pizza crust, and using a football cookie cutter, cut out...well, the football shapes. Place mini crusts on a greased baking sheet. Spoon a small amount of pizza sauce over each football. Follow with a good layer of wilted spinach. Top with a good sprinkling of goat cheese and a layer of red pepper. Decorating Tip! While pizzas are baking, cut string cheese for the laces: Peel a few pieces of the string cheese into thin threads, and cut those into smaller pieces. When you remove pizzas from the oven, place string cheese on top in a lace pattern, then return pizzas to the the oven for another 3 minutes or until crusts are done. Drizzle each football pizza with a nice drizzle of oil and a few grinds of pepper, and serve immediately. I'll be the first to admit I know very little about football. All I really know about it is that when you slam dunk, it's called a home run. And when you do a header across the net, that's called a strike. I guess I know at least that much! What I DO know a thing or two about is eating. And using a football-shaped cookie cutter to make delicious little game-day Football Spinach Pizzas to eat while the big match is on the TVs. These little football pizza pies will absolutely keep your vegetarian guests giddy, but if you have meat lovas in the house, feel free to sprinkle some crisp bacon on top. You don't want to FUMBLE ON GAME DAY, RIGHT!? Ohhhhhh, me. Seriously though. Make these. Double, triple, gazillionduple the recipe, and scooooore with your guests! First off, grab your goods. Pillsbury thin crust pizza, spinach, bell peppers, goat cheese, pizza sauce, salt and peppa. Chop up the bells and saute them for a sec. Set them aside as you wilt the spinach. Seriously, nothing in this life is better than wilted spinach. Use a football-shaped cookie cutter to cut out 9 football shapes. I reshaped the dough and rolled it out again to get those last few footballs. I've never said that sentence in my entire life. 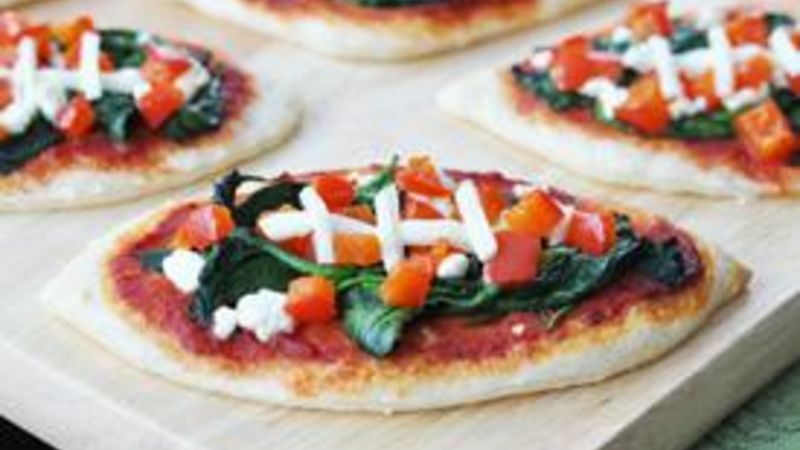 Layer each pizza with a little Muir Glen pizza sauce, the spinach, goat cheese and red bells. Bake 'em up for about 6 minutes. Decorating Tip! To make the laces, peel a few pieces of the string cheese and cut into smaller pieces. Place cheese on top and return pizzas to the oven for an additional 3 minutes or until those crusts are golden brown and done. *Bev wants you to know she was joking at the very top of this post. Oh wait, you probably already knew that. For more musings, visit her blog Bev Cooks and her Tablespoon profile.